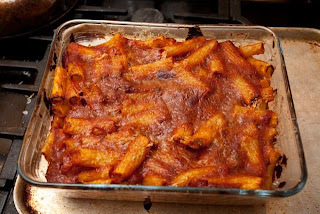 Following in the tradition of me posting non-BBQ recipes in the freezing winter months, this one's another tomato based dish, this time adapted from the Baked Ziti recipe (with Sunday Gravy) from the Sopranos Family Cookbook (now sadly out of print and going for serious money on ebay). 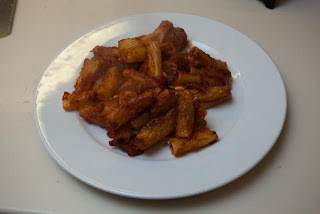 Tony Soprano called his mother's Sunday Gravy "the red lead" in some episode or other, and here's my version. There are two parts to this - the sunday gravy (a tomato sauce) and meatballs then made into a pasta bake. It is architectural meat cookery and takes 2 days worth of gentle afternoon/evening cookery or one whole afternoon and evening. If doing in a leisurely fashion, make the gravy on the first day and finish the second. 4 cloves of garlic, or more. Peeled and cut in half. You are basically making a meat stock using tomatoes instead of water. Oh yes. First brown the bones over a medium low heat in some olive oil. A good 10-15 mins of browning turning frequently is required to get the most out of the bones. Remove and reserve the bones. Then brown the sausages, removing and reserving once browned all over. You need to liquidise the tomatoes. Put a tin and a half or however many fit in your liquidiser in and swill out the tins with a little water and add that to the liquidiser and blitz. Now add the garlic to the oil and fat in the pan and cook gently for a few minutes. 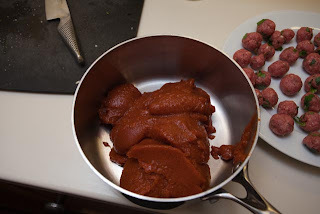 If you were using tomato paste add that now and fry a bit to colour the fat. Place the bones and the sausage back in the pan. Put in the liquidised tomatoes and turn the heat up. Liquidise the rest of the tomatoes with a little water each time to swill out the juices in the tins, and add to the pan. When the red, foaming cauldron approaches a boil, put it on a very low heat and blop away for at least 2 hours - I did about 5. Remove the bones and sausage. Keep the sausage in the fridge for tomorrow, sling the bones. Pass the mixture through a sieve, pushing it through with a spoon or something, discarding any bits of gristle, chipped bone, etc that remains in the sieve. Stick the resulting red lead in the fridge overnight. First, eat those sausages in a sandwich for lunch - two slices of bread, butter, thick slather of dijon mustard. Mix all the ingredients together very well with some salt and pepper. Form into meatballs about the size of a grape. Fry in a hot non-stick pan until well browned all over. Meanwhile, reheat the red lead. 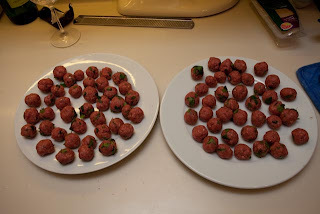 When the meatballs are ready, add them to the red lead and blop on the lowest heat for 30 minutes. Cook the pasta and drain it, then return to the (now empty) pan you cooked the pasta in. 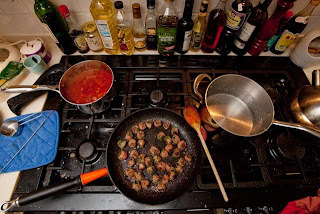 Fish all the meatballs out of the sauce and add to the pasta along with a cup or so of the sauce, and mix well. Stir in half a cup of freshly grated parmesan and mix well. Heat the oven to 180C. Add half the pasta and meatballs to the dish you want to bake the pasta in. Top with the ricotta broken up into chunks and the mozzarella chopped up into chunks (if using). Grate over a load more parmesan. Pour on half the remaining sauce. Put on the other half of the pasta and meatballs, top with the rest of the sauce and more parmesan. Cover with foil and place in the oven. Bake for 20 minutes, remove the foil and bake for another 15. Serve with plenty of red wine.